I keep seeing this in a couple of the design blogs I read and it's a trend that can't go away fast enough if you ask me. Since I'm going to start writing about cheap fixes, this is an easy one to avoid at all costs. Chalkboard paint isn't cool. Ever. A couple of the guys who write for Apartment Therapy have never seen a use of this nonsense that they didn't love. 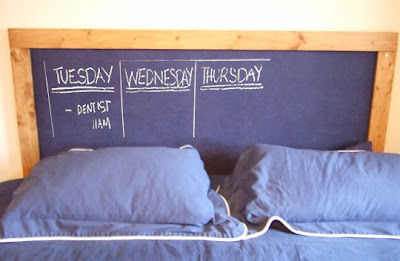 Last week, one of them wrote a glowing review of a chalkboard headboard in somebody's bedroom. Yeah, I can see me living with something like this over my head every night... Give me a break. 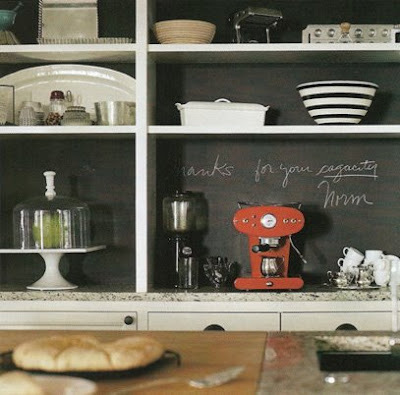 Chalkboard paint is juvenile and cheesy looking. Two things to avoid at all costs if you're going to tackle something on your own. Ugh. It strikes me as some kind of a forced march back to childhood. As lovely and idyllic as my childhood was, it was my childhood for crying out loud --something adults are supposed to leave behind. Or are we not doing that anymore? As the mother of a 4-year-old who has her own chalkboard (not on the wall, but a good old-fashioned school chalkboard in her playroom), I can attest that the chalkboard on the wall idea is NOT a good one, especially if you have young kids. First, we teach our kids NOT to write on the walls. Little ones who are capable of writing on the walls may not quite have the mental acuity to understand writing on walls w/ chalkboard paint vs those without. Maybe it's not rocket science, but I wouldn't pose that decision to a 3-year old. Second is the chalk dust. It stinks to have to clean it up -- it gets your hands messy, gets on other furniture, etc. Third, the excitement and newness wears off really quickly, and then you're left with a chalky, silly, messy wall. And YOU'RE stuck making something appropriate for the room, and you run the risk of your kid erasing it, meaning you live with a blank messy wall or constantly redo something to cover the blank space. Yeah, I'm completely with you on it. Avoid at all costs.